Answer this question before reading tonight’s review: How do you generally enjoy spending your Christmas? Is it sitting by the fireside and reveling in a classic Christmas film about family and the importance of giving? Or do you enjoy watching French people, blood and grue, and other terrifying things on Christmas? If you answered to the latter then you’ll love tonight’s 25 Days of Christmas film: Inside (or as the French call it A l’interieur…there’s a few fancy curlicues above the “e” but I can’t get them on my computer). 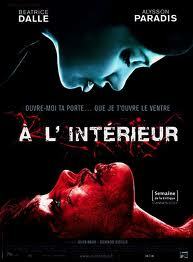 Inside is a brutal, gross film DEFINITELY not for the faint of heart. So why the hell did I pick this as a Christmas movie? Because I enjoy Christmas based horror…and this is my blog! I did watch a Christmas horror film on Halloween, the great British film The Children, go watch it and fear your kids. Inside is a somewhat similar film to The Children in that it also tells you to fear your kids, fear that someone might cut you open to take them away. Sarah (Alysson Paradis) has recently lost her husband in a car accident and is set to give birth the next day on Christmas. In her last night of “peace and quiet” she’s interrupted by a knock at the door. A mysterious woman wants to use her phone and when Sarah doesn’t let her in, the woman reveals she knows everything about Sarah and does her damndest to get inside. Once she does, La Femme (Beatrice Dalle) has one goal: to cut out Sarah’s baby and keep it for herself! Despite my views on kids (I don’t like them), I love horror movies about pregnant women. It’s something about the way the fears of women during pregnancy are personified in the horror, you don’t need to be pregnant to experience the terror and yet it’s even scarier if you’re about to have your own child. Inside deals with many fears of being a mother, predominately the fear that someone will cut out your baby. There’s been several stories in the news about women being killed and their children being ripped from their wombs so the fear is legitimate. Sarah is in an even more fragile state because she has lost her husband and has doubts about keeping the baby. She’s not happy, as most expectant mothers are, and as the film progresses there are elements of the tale that could be snide remarks on abortion. As much as the film has deeper themes on motherhood most watch it for the blood and gore. I watched Inside late last year for the first time and rewatching it, I didn’t understand why I didn’t remember the last fifteen minutes of the movie (the film clocks in at an hour and 22 minutes). That’s because by the end blood is LITERALLY pouring down things. Sarah locks herself in a pristine white bathroom and by the end that entire room is covered in dried blood. Even her person and clothes are red by the end. Again, a lot of this can be symbolic of passion for her child, and the war being fought for the baby but the French definitely love red corn syrup. I’ve seen two French horror films (this and Martyrs) and they are beyond fucked up! Their horror is unflinching, bloody as hell and extremely hard to watch. Trust me when I say if you’re the least big squeamish don’t jump into becoming a horror fan by watching French horror, it’s only for the strongest of horror hounds. Back to the film itself, the acting in this is strong for a horror movie. Beatrice Dalle is dangerous and oddly beautiful as the evil woman known only as La Femme. You feel for Sarah in her ordeal yet by the end you feel bad for La Femme as well, I won’t give away why. La Femme rationalizes that Sarah doesn’t want the baby, which is true, and why not give it to someone who loves it? Again, it’s a more horrific route in terms of giving an argument against abortion, but the director doesn’t seem to give a stance on it one way or another. The film also makes motherhood a bloody rite of passage, again literally, as no one becomes a mother by choice and/or through legal means in this film. Sarah ends up doing something pretty awful ***SPOILERS***killing her mother by accident***END SPOILERS*** and it ends up foreshadowing the entire film. When the film ends it seems to say that motherhood has been built on killing, that both children and parents can die, and that through that another life is changed. In general, this being my second viewing, I still don’t know if I like this movie. The gore is great (I’m a gore hound) and the story is solid, but the third act is just stupid! There’s a revolving door of characters who show up to check on Sarah and through one stupid way or another they’re quickly killed. The first two characters I could understand, no one knew they were there, but when three or four cops are killed it’s surprising that backup isn’t called or no one comes to check on the cops! The one cop at the end says he’s going to radio for help back at his car, never mind that he should have done that when he noticed two of his partners disappeared and he heard gunshots, but he takes a detour (with a young kid who was arrested earlier that evening…a fricking civilian!) to turn the lights back on. Meanwhile he leaves Sarah, our pregnant heroine and La Femme is still missing, alone to take a nap!!! Are you kidding me?! By the end a few characters come back to life through ridiculous means, highly deformed to the point it looks like a showdown between zombies and a woman in black! It just becomes stupid and head-slapping which is a shame considering the first half of the movie is so well done. I recommend this to the true horror fan, those who can ignore stupid horror conventions, or those looking to spice up their Christmas or at least make your mean aunt nauseous.